← Mobile Food Truck returns soon!! There are so many needs in this world, and it takes the dedication of so many to help to fill those needs. One way the Huntsville Junior Service League works to support our neighbors is through the delivery of food through the Meals on Wheels program at the Senior Center of Walker County. The Senior Center delivers meals every weekday to many community members who cannot easily get out of their homes or prepare meals. Having recently retired and feeling the need to be more useful, I called the Senior Center, not to use their services, but to help with “Meals on Wheels”. This has been one of the most enjoyable and rewarding “jobs” I have ever held. To have a sweet face with a sweet smile answer the door really makes my day. Often time I am told how much the hot meal is appreciated and how much they appreciate the effort to bring the meal to them, especially when the weather is bad. One dear lady commented on how she liked my rubber boots-blue with pink horses. To give a compliment about their pretty flowers or figurine on their porch, can give them something to talk about. Leaving a “thought for the day” card with their meal will often bring a word of appreciation on the next delivery day. This gives meaning not only to my life, but hopefully theirs, too. As long as I am able, I plan to be doing something to help brighten the day for the dear people I have grown to love. It doesn’t take much to bring a smile and it certainly puts a smile in my day. Having delivered many times, I can agree with Mary’s sentiments. 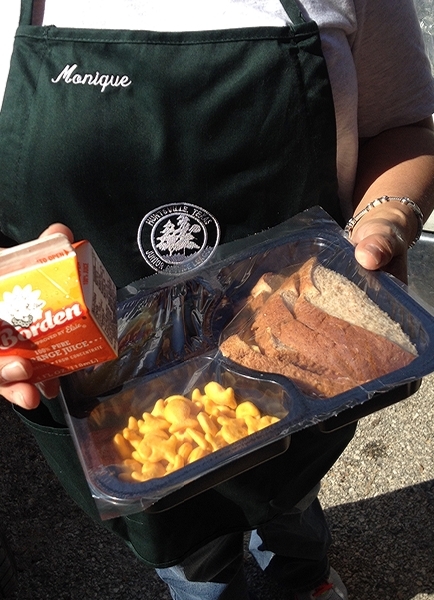 Meals on Wheels is a wonderful way to fill a very basic need and put a smile on someone’s face at the same time. If you haven’t yet had the opportunity to volunteer through this awesome service, give it a try. It is very rewarding! !